What’s at stake? Control over two female frozen embryos, held in a Beverly Hills fertility center. When Sofia Vergara and Nick Loeb were engaged, they decided to use in vitro fertilization and a gestational surrogate to have a baby. Their first efforts failed when two prior embryos did not successfully implant in the woman they chose to carry the baby to term. Vergara and Loeb tried a second time, again leading to the creation of two viable embryos. Before the new embryos could be implanted in a different surrogate, the couple called off their engagement. This opened the door to the question about what should be done with the two embryos. When Loeb and Vergara started the process, they signed a directive form with the IVF medical center, which included sections to “declare our intentions and desires” about what was to be done with the embryos. The couple completed the directive form and chose to allow the embryos to thaw if one or both of them passed away. By thawing, the directive indicates, the embryos would be destroyed. The directive said that unless both parents mutually agreed to use the embryos, either for implantation or otherwise, they would remain frozen. They can only be destroyed if both Sofia Vergara and Nick Loeb agree, or when one of them dies. Seemingly, that would put the matter to rest, right? Since Sofia and Nick clearly don’t agree, the embryos will remain frozen. If they never do agree what to do with them, eventually, of course, they will be destroyed. Sofia Vergara’s position is that she is content to allow the embryos to remain frozen, and she has no desire for a child with Nick Loeb. She has never stated that she wants to destroy the embryos, according to her attorney’s statement. This position is not enough for Loeb. His lawsuit asks a Los Angeles judge to order that the embryos cannot be destroyed under any circumstances. He wants the survivor of the two of them to have control over the embryos, after the first of them dies. Nick Loeb also says that he offered to pay all costs associated with the embryos, and asked Vergara to sign off all rights and responsibilities for them as a parent — but still with the option of having a relationship with any child in the future if she wants. Nick Loeb says that this disagreement was important enough for him to start a lawsuit because he strongly believes that life begins at conception. Loeb feels it is his obligation as a parent to make sure that these two embryos are never destroyed. He also wants to fulfill his dream of becoming a father. Interestingly, when Loeb’s attorney started the lawsuit, he filed it anonymously so this matter wouldn’t be made public. It was leaked to the media within a few weeks, though, and both sides have acknowledged that they are the parties involved in the court dispute. At first blush, from a legal perspective, this seems to be a simple matter. Sofia Vergara and Nick Loeb signed a form directive indicating what would happen to the embryos — they remain frozen until both agree otherwise, or one or the other passes away. Loeb claims the directive is not valid because the health care provider did not give them another option to consider, donating the embryos to another couple or individual. As such, the attorney alleges, the directive did not comply with California law and should be disregarded. With allegations of this nature, it is no wonder that the Modern Family star plans to fight to protect herself and her image. It is troubling that Nick Loeb — the wealthy descendant of the Loeb and Lehman families, who both founded successful financial firms — would turn to these types of accusations to try to convince a court that he was coerced into signing the directive. 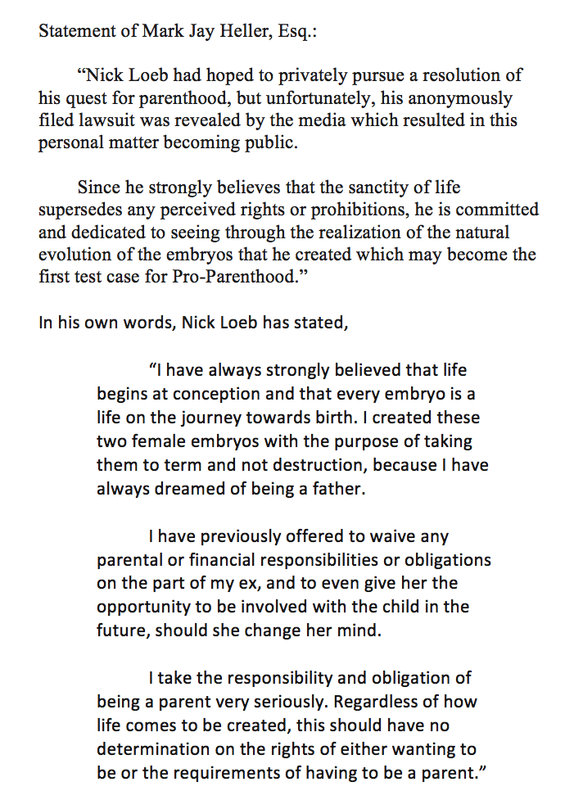 Surely Nick Loeb had the option to walk away, or simply not sign the document, if he was not comfortable with the embryos being destroyed if one of them died. His claim of coercion likely will not succeed in having the directive overturned. The more interesting legal questions will be whether allowing these embryos to remain frozen indefinitely, and eventually destroyed, raise any constitutional issues, such as the right not to be deprived of life, liberty, or property without due process of the law. Does that apply to frozen embryos created under these circumstances? How about the rights of a person who wants to be a father? This lawsuit seeks to answer these types of questions. With so much at stake, it’s possible the litigation and appeals could take many years to resolve. If Loeb and Vergara don’t come to a resolution on their own, this may be unavoidable. This case presents a good lesson for anyone planning to start a family with a significant other, married or not, when means of conception like IVF are used. Couples should carefully think through the implications — ahead of time — about what will happen to embryos in the event of a break-up, divorce, death, or disability. No one needs to rely on a rushed and awkward conversation in a medical office when a form directive is placed down on the table. As a “directive” form, the document serves a similar purpose to a living will, advance directive, or other end-of-life document that many people incorporate as part of thorough estate planning when addressing the difficult decisions about when to refuse life-sustaining treatment when there is no quality of life. Just like end-of-life planning documents, no one should ever sign a directive like this unless he or she is completely comfortable with the implications. If there any questions, concerns, or when couples cannot agree what should happen, they should seek the advice of an attorney. A directive to donate, destroy, preserve, or pass on embryos that can no longer be used for their intended purpose is a critical component to any Assisted Reproductive Technology pregnancy, and should never be addressed in a rushed manner, like was apparently done in the Loeb v. Vergara case. This is not an uncommon issue — one in six couples face fertility problems, and more than five million babies have been born, worldwide, through IVF and other ART means. Hopefully future couples facing this path can learn from this dispute and plan ahead for potential problems in a better manner than Sophia Vergara and Nick Loeb.